All the balloon decoration shown on this site is the work of the Inflated Ideas design team unless stated otherwise. No photos may be used without prior permission from Inflated Ideas. An email or written confirmation of event date, time, location and any other details deemed necessary to complete your decor, alongside a non refundable payment of £50 which is treated as a deposit. 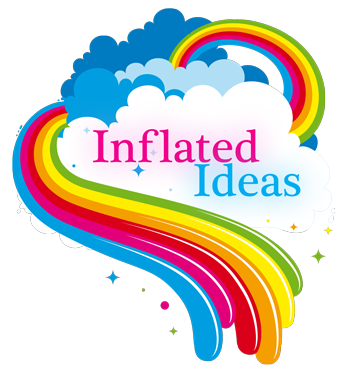 In many cases Inflated Ideas will visit your venue to discuss with you your full requirements, this is a free service once the £50 deposit has been recieved. No order details can be changed any later than 4 weeks before the event. However if you require more decor we can in some cases accomodate this. All payments must be recieved by 4 weeks before your event, this allows us to order in any materials in time. No monies will be refunded after this except in exceptional circumstances at our discretion. Payments may be made by cheque with a gaurantee card or credit card (coming soon). Some of our designs include decor made using specialist bases or framework. There is a deposit payable on these which is refunded in full to you on return of the item in the condition in which it was given.You will be advised on this when you order. BOOKING FEE - A non refundable booking fee of £50 is required from clients in order for us to reserve a training date in our business diary. PAYMENT - Payment for your courses may be made in one of the following ways. ADVANCE PAYMENT - Full payment in advance by Cheque, PayPal or Bank Transfer Payment. PAYMENT INSTALLMENTS – Half Payment in advance by Cheque, PayPal or Bank Transfer with balance paid on the day of your course in Cash. LOW INCOME PAYMENTS – If you are on a limited income & wish to pay in small instalments each week we are able to set up a longer term payment option – so long as all course fees are paid prior to commencement of your training – Please ask for details. NABAS COURSES REGISTRATION – Upon booking, students are registered with NABAS the National Balloon Association and Course books are ordered and paid for by the Balloon Training Academy on your behalf. CANCELLATION - Once payments are received, the Balloon Training Academy will either allocate places to you on a group course or where applicable block entire dates out for private training. Registration with NABAS, Ordering of Stock & Helium and Instructors time will be ordered/paid for at this point. In the unfortunate event of a student becoming ill or a close family member (mother, father, child) becoming ill then the Balloon Training Academy will do their very best to allocate the student a space on a future course. If a student decides for any reason, that they no longer wish to attend their pre booked course but have already paid, then a refund can only be made if the Balloon Training Academy is notified in writing a minimum of 14 days prior to the course dates OR the Balloon Training Academy are able to rebook the slot with another student. If the course is cancelled within 14 days of the course date and full payment is not received then full payment will be due and pursued. NOTE - Balloon Training Academy will endeavour to provide all students with first class training taught by our staff of award winning balloon artistry instructors. We always do our best to accommodate student’s wishes where possible and will offer a comprehensive aftercare service to help students build their business and establish themselves within the balloon and party sector. A copy of these terms will be sent upon request.